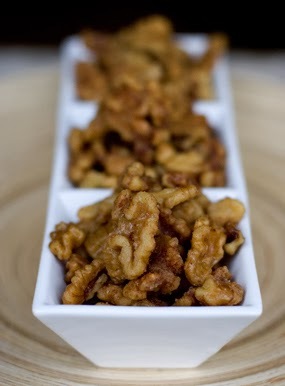 Around the holidays a quick at hand appetizer is good to have when you have people dropping by unexpectedly. Something you can throw together quickly, and this falls into that category. Microwave the nuts for 5 minutes stiring once half way through. Stir in a bowl 1 Tablespoon of sugar with the curry and salt. Combine vegetable oil and butter with 1 teaspoon of sugar in a saucepan. Heat over medium heat whisk constantly until butter melts. Add nuts, cook for 2 minutes. Let the nuts cool 10 minutes before serving.